AMPAC USA, a leading manufacturer of the household, commercial and industrial reverse osmosis and seawater desalination systems has gained many accolades over the years. These accolades not only boost customers' faith in the brand but also boosts the overall reputation of the company. California, February 11, 2018	(Newswire.com) - The organization was recently honored when it found recognition in the Seawater Desalination Systems Market Trend Report. The CEO of the company expressed immense delight on this valuable and highly worthy inclusion. 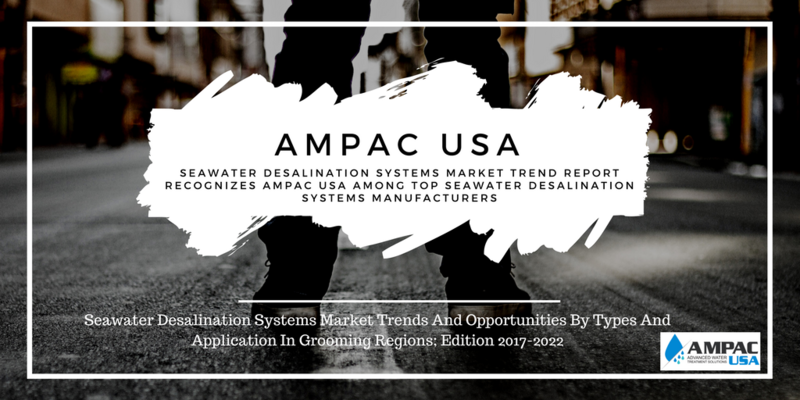 AMPAC USA was mentioned in the report entitled "Seawater Desalination Systems Market Trends and Opportunities by Types and Application in Grooming Regions; Edition 2017-2022". This report has intensive analysis, complete coverage and actionable market insights to spot opportunities available in potential as well as existing markets. It also highlights the top dynamics of the current industry. Key challenges were also highlighted in this valuable report. Apart from AMPAC USA, the other Seawater Desalination Systems manufacturers listed in this report are GE, Toray, Alpha Water Systems Inc., Wellthy Corporation, Xylem, Shuangliang Eco-Energy Systems Company Limited, Applied Membranes, and ProMinent. AMPAC USA shares the different conditions where seawater desalination can be useful and where it can be let go. The technology has been a boon for countries like Israel where today the nation produces more agricultural goods than it needs. A lot of countries see the technology as a solution too but financial status does not allow them to take it up as one.